He is the number two ranked welterweight in the UFC. He has won three straight fights, all against top 10 welterweights (Demian Maia, Tyron Woodley, Tarec Saffiedine). He was guaranteed a title shot after his last victory. Never happened. So what is the deal UFC? 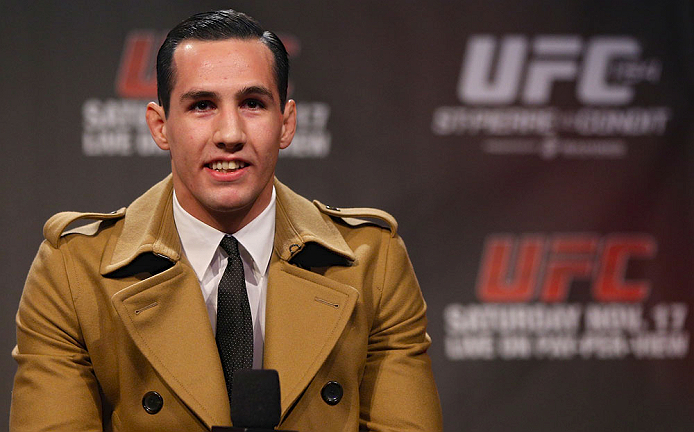 Rory MacDonald (18-2, 9-2 in the UFC), has done everything required to earn a title shot, including his recent dismantling of Tarec Saffiedine back in October, yet he will have to site and wait again and see welterweight champion Robbie Lawler and Johny Hendricks go at it for a third time for the welterweight title. Dana White acknowledges the situation and agrees it is a tough one. On UFC Tonight, White said, “You say a guy is next in line, but you don’t know how that fight’s going to turn out. And when you have a war like you had with those first two fights, Johny wins the first one. Robbie wins the second one. A trilogy makes sense. It’s not that Rory isn’t next in line, he is. But now he’s just next in line behind this fight”. Macdonald may have to take one more fight before he the dust settles between Lawler and Hendricks, and the trilogy ends. This is a high risk for MacDonald, as a loss will set him back from a title shot, yet, a win would only make MacDonald the clear cut candidate to be next for a shot. Who could MacDonald face? Carlos Condit is set for his return from an ACL injury. Condit, now ranked four in the welterweight ranks, suffered his injury last March against Woodley. Another potential candidate for MacDonald would be Hector Lombard (#5 rank), who just won his third straight fight over Josh Burkman at UFC 182. Lombard, like MacDonald, is making his case strong for being next up for a title shot. Regardless who is next, MacDonald can taste that title shot, and with one, last, win…he may finally see it. Previous UFC 182 Aftermath – What’s Next for the Winners/Losers?